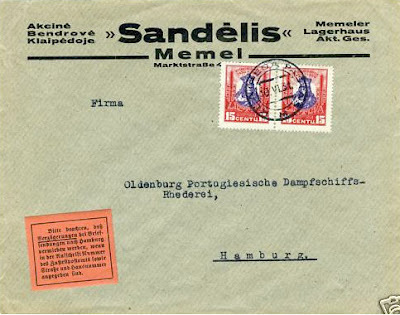 Cover from Klaipeda (Memel) to Hamburg, Germany dated 10 June 1931. Lithuanian domestic rate of 30 c. The domestic rate to Germany was allowed until 1936. Klaipeda Pastas "M" cancellation. No markings on reverse. The label states that delays can be prevented when a complete address is provided.